PostHome » Día de los Muertos: Exhibition, Parade, Workshops & Tours! Available for schools and small groups. To reserve a tour and/or workshop, please contact Gary Tuma at 414.672.2787 ext. 10 or gary@wpca-milwaukee.org. Celeste Contreras conducts an ofrenda (altar) workshop in WPCA’s Blue Box Theater. Lunch and materials included, all you have to do is bring a photo or photos of the ones you want honor! Please contact Gary Tuma at 414.672.2787 ext. 10 or gary@wpca-milwaukee.org to reserve your spot in this workshop. Space is limited to 15 participants, adults only please! 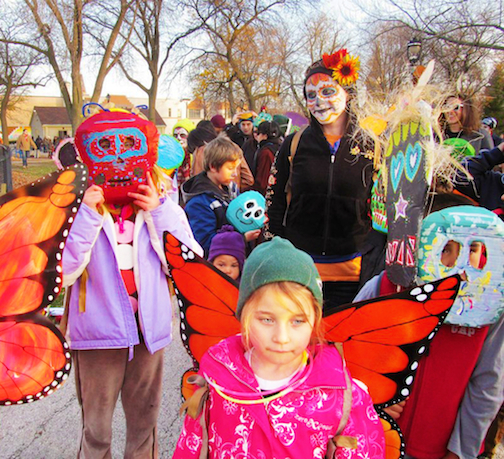 October 2013 marks 21 years of WPCA celebrating Día de los Muertos (Day of the Dead), a rich Mexican tradition. Curated by local art historian, Juan Lopez, this traditional celebration will include a touch of contemporary flavor with ofrendas(altars/offerings) created by local artists of various backgrounds in addition to sculpture and 2-D work related to the holiday. Día de los Muertos recognizes death as a celebration of life. It reminds one to reflect on what they value through the commemoration of loved ones and their lives, while at the same time generating enthusiasm for the friends and family around us. As the celebration progresses, this dynamic gathering of people transforms itself into a festivity of life. Informational tours and culturally relevant crafts for kids are available during the course of this exhibition.